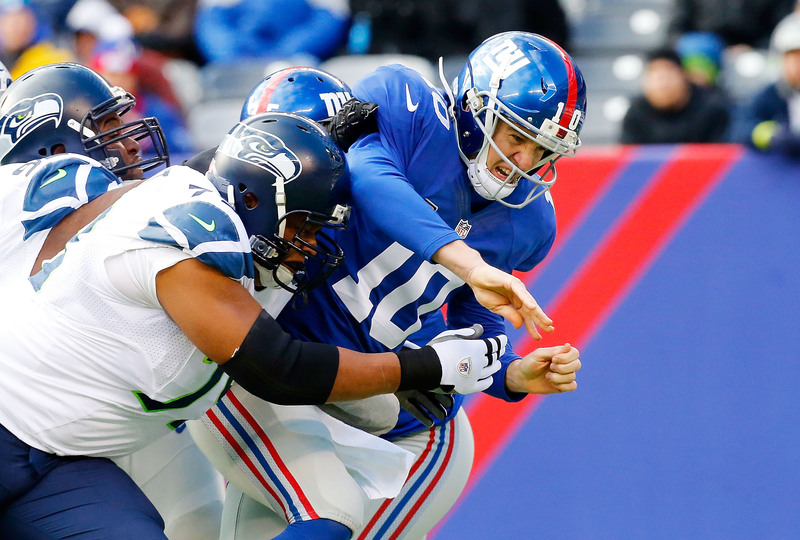 On Monday, Grantland published Part 1 of the annual NFL Trade Value column. Click here to read the first installment as well as a breakdown of the rules and how the picks are made. These are two great left tackles with different contract situations. Brown, who missed two games during Houston’s disastrous 2013 season, is two years into a very manageable six-year, $53.4 million contract that will never see his cap hit rise over $10 million. Average-or-worse left tackles were getting deals in that range this offseason, and Brown’s a great one. Smith, meanwhile, is still just 23 years old and made the first of what will likely be many Pro Bowls last season. It’s crazy to think he’s just a couple of weeks older than Eric Fisher, who was the first overall pick in last year’s draft, two seasons after Smith entered the league. The Cowboys have him signed for one more year at a cap hit of just less than $4 million and picked up his team option for 2015 at just more than $10 million; they may use the cap space vacated by a released Tony Romo to lock Smith up to an extension in 2016. Wow, did that arbitrator’s ruling cost Graham a lot of money! Yes, we understand he reached a deal with the Saints, but to understand his value here is to understand the difference in what he could have cost the team. To begin, here’s what it would have cost the Saints to franchise Graham over each of the next three seasons. Defining Graham to be a tight end saved the Saints more than $5 million this year, the difference between the franchise tag figure for wideouts ($12.1 million) and tight ends ($7.1 million). It also totally changed the terms of Graham’s extension-to-come. Pretend, for a moment, that Graham is ruled to be a wideout. In 2015, the Saints can’t afford to franchise him again; they already have $141.8 million committed in 2015 against an expected cap in the $140 million range, and that was without a Graham contract on the books. They would make him among the five highest-paid players in football with a third franchise tag in 2016, at which point the Saints would have zero leverage. In all likelihood, the Saints would either have had to give Graham a six- or seven-year contract with more money, both in the signing bonus and the base salaries early in the contract. The alternative would be losing Graham no later than the 2016 offseason. Instead, by keeping Graham as a tight end, the entire leverage component changes. The Saints can absolutely justify franchising Graham two years in a row, given that there’s a difference of more than $6 million between the two figures in 2015 and more than $11 million over the two-year stretch. It changes the baseline of a contract extension from that of a star wide receiver to that of a star tight end, and those two aren’t remotely comparable. Before Graham received $21 million in guaranteed money, the largest guarantee ever given to a tight end was the $16 million received by Dennis Pitta and Jared Cook. There are 14 wide receivers in the NFL right now with a guarantee of $16 million or higher. Graham has numbers comparable with the best wideouts in the game. He just won’t be getting paid like them over the years to come. Put it this way: Everson Griffen has started one game in four seasons for the Vikings, but because he has contributed 17.5 sacks in part-time duty, Minnesota gave him a five-year, $42.5 million deal with nearly $20 million guaranteed over the next two years. Every team in football would take Clowney over Griffen based on the former’s college tape and athleticism alone, and he’s on a fully guaranteed four-year, $22.3 million deal with a fifth-year option that should come in around $12 million. Even if Clowney’s not a superstar, he can still be enormously valuable if he comes in with Ryan Kerrigan–level production on an annual basis while retaining a ceiling that Kerrigan can’t touch. And if Clowney really is the once-in-a-generation pass-rusher many project him to be, he’s a top-10 value for each of the next three seasons. As long as he stays healthy, it’s hard for this pick not to work out for Houston. Hardy, meanwhile, will make more with the franchise tag this year ($13.1 million) than Clowney will make over the next two and a half seasons combined. You would rather have Hardy in a vacuum because the 25-year-old has actually done it at the pro level, having produced a DPOY-caliber season with 15 sacks a year ago, but there’s a good chance Clowney actually outproduces Hardy next year at a fraction of the cost. Actually, switch these two up. Clowney’s at 25 and Hardy’s at 26. Carolina’s playmaker and defensive leader, Kuechly was a worthy choice as Defensive Player of the Year in his second season as a pro. Blessedly for Carolina’s still-terrible cap situation, Kuechly is two years removed from a serious raise and still has three cost-controlled years left before he’ll be due an extension, at which point Carolina’s cap woes should finally be over. The reason he’s not higher is simply that teams don’t value middle linebackers all that much; it’s why Kuechly, who just about everyone agreed was a star heading into the 2012 draft, fell to the Panthers at nine. This is about as high as it gets for players at a non-premium position; after Kuechly, 22 of the final 23 selections play one of the five critical positions in the modern pass-first game (quarterback, wide receiver, left tackle, pass-rusher, and cornerback). Staley was originally ahead of Thomas on this list solely by virtue of his incredible contract, which had four years and $21.6 million in unguaranteed money left to go, a pittance for a great left tackle. Unfortunately, his contract was so great for the team that Staley noticed. The 49ers signed him to a two-year extension this past week, which adds some cash to the deal, and while the specific terms aren’t available yet, it’s likely enough to move Thomas back ahead. Because there aren’t good stats for offensive linemen, and Thomas plays for what’s been a terrible football team, he dominates in almost total obscurity. His Rotoworld page has been updated nine times in seven seasons. You can’t even make the (very tired) “he’s the hipster football player” joke, because that would imply a cultural resonance he doesn’t have. Heavy investment, works pretty well despite a total lack of interest … Joe Thomas is the Google Plus of football? The only reason he’s not the clear choice over Staley is that Thomas also gets paid like the best left tackle in the league, as his $12.3 million cap hit is the largest of any tackle in 2014. Every quarterback ahead of these three on this list is either significantly younger, significantly cheaper, or at a different level of production over the past several seasons. You can’t count the class of 2004 out, but it’s likely they’re closer to the end of their careers than to the beginning. I feel so old right now. Can’t it be 2004 again? Just for like a couple of weeks? Can’t there be a Zach Braff Kickstarter for this? He wants it to be 2004 again, too, just like me! Of these three, I’m obviously biased toward Manning, Grantland’s official quarterback, but I think this is pretty clearly the way to rank them. Roethlisberger’s perennially the most beat-up of the three, and while he made it through all 16 games for just the second time in his career last season, it seems unlikely that will become a habit. Since 2005, Roethlisberger has missed a total of 15 starts, while both Manning and Rivers haven’t missed a start since taking over as their team’s respective starters (although Rivers did tear his ACL in the postseason). That’s too much risk to assume for a quarterback being paid market value or better going forward. Manning was downright terrible last season, leading the league in interceptions (27) while posting below-average numbers in every category. He’ll bounce back some with a healthier supporting cast, and it’s unlikely that he’s done at 33. Rivers was by far the best of the three a year ago, with his play revitalized by new coach Mike McCoy after years of slow decline under Norv Turner. You wouldn’t want to count on him flirting with completing 70 percent of his passes again, but even if Rivers gives away some of his 2013 gains to Manning, he would be the best of these three and a viable Pro Bowl candidate. Things suddenly got a lot cloudier on the Miller horizon; after two seasons of steady devastation, Miller failed a league drug test and was suspended for six games after trying to defraud the system in the process. He came back with 16 new pounds of muscle, which sounds like he defrauded the system anyway. (That added weight is now being spun as a problem that Miller dieted off this offseason.) Miller then came back and only showed glimpses of his former self before tearing his ACL in Week 16 and missing Denver’s playoff run. He should be back in time for Week 1, albeit not at 100 percent, but with new arrival DeMarcus Ware around to take some of the pass-rushing pressure off him, he doesn’t need to be 100 percent. Denver picked up Miller’s fifth-year option, leaving him on a two-year, $16.3 million deal in terms of his cap hold, but the clear path to the biggest contract in linebacker history that was there last year isn’t quite as obvious anymore. Yes, Green’s ahead of Johnson. I don’t think it’s that controversial of a call, either. Megatron’s the better player, albeit one with more nagging injuries than Green seems to deal with. But Green’s not far off. He has produced virtually identical seasons over his sophomore and junior seasons, with a 97-1,350-11 line in 2012 followed by a 98-1,426-11 line in 2013. Megatron has averaged 95-1,564-11 over the past four years. OK, that’s not exactly a fair comparison, but Green’s about three years younger than Megatron, he plays with a far worse quarterback in often-dreadful weather, and, perhaps most importantly, he makes way less money. Johnson’s cap hit this year after restructuring is just more than $13 million, and it rises over $20 million during each of the next three seasons. Green, meanwhile, will make $6.3 million in this final year of his rookie deal and $10.2 million the following season with the fifth-year option Cincinnati picked up. Even if Cincinnati franchised him in 2016, it would probably be looking at a one-year price in the $14 million range. Cincinnati will have about $30.5 million in cap hits from Green over the next three years if things go as planned; Detroit will owe Johnson nearly twice as much at $57.6 million over that same time frame. The salary difference just isn’t commensurate with the skill difference. Green’s the better trade chip. This is the player with the biggest gap between his ceiling and floor, right? The floor is Griffin suffering another knee injury that would make his issues (both in terms of physical fitness and ability to avoid hits) critical and evaporate his value. The ceiling? I mean, you can make a case that Griffin was the best quarterback in the league on a per-play basis as a rookie. He was fifth in completion percentage, first in yards per attempt and interception percentage, fifth in QBR … and that was with Josh Morgan and Logan Paulsen as two of his starting pass-catchers. He replaces those two in 2014 with DeSean Jackson and Jordan Reed. The wild card: new offensive coordinator Sean McVay, infuriatingly just 28 years old. Anything is possible from here. Forever joined at the hip thanks to the contract extensions each of these two received this offseason, Sherman and Thomas have gone from being bargains to among the highest-paid players at their respective positions. And yet they’re up in the rankings this year from 24 and 23, respectively, because of what they did this past season in bringing a world title to Seattle. Thomas is the tiniest bit ahead of Sherman because I suspect Seattle would be more likely to trade Sherman; he plays the premium position at corner, but Pete Carroll has basically minted a factory of very good cornerbacks and could probably get by in the Cover 3 with Byron Maxwell and whatever fifth-round pick he wants to suddenly turn into a superstar (Tharold Simon!). There’s no replacing Thomas, who has made it to three Pro Bowls and been named to two All-Pro teams before even turning 25. I wrote a lot about what Thomas does in my 2014 Super Bowl preview, but more than anything, he takes the faucet in the middle of the field and shuts it off. Kam Chancellor gets the big hits. Sherman gets the big plays on the outside. Thomas silences existence everywhere behind them. … but in a vacuum, you would take a near-perfect corner on a cheap contract over a perfect safety on an expensive one. And Peterson is still pretty cheap. Even as we get further removed from his dominant season as a punt returner in 2011, Peterson has matured into a no. 1 cornerback with the speed and size to match up against anybody else in football. Put it this way: The Cardinals had the second-best pass defense DVOA in 2012, at which point they let three of their four starting defensive backs go, retaining only Peterson. Arizona only dropped to fifth in 2013, and that was with injuries all around its starting 11. The Cardinals had the best DVOA in football against no. 1 receivers last season, a coverage task that often falls to Peterson. He does all of this for relatively cheap; Peterson will have a $5.9 million cap hit this year and a $10.1 million hit for his fifth-year option in 2015. He’ll likely sign an extension before then, but Arizona can use these team-friendly years as leverage to bring his costs down. OK, maybe it’s unfair to lump the 29-year-old Ryan in a group where everybody else is 35 or older, but compared to the quarterbacks who have come into the league since Ryan, he plays like a 35-year-old. Ryan’s the only guy on this list whom you might struggle to imagine winning a Super Bowl with the right team around him, which is silly; he was one Harry Douglas slip away from likely making the Super Bowl two years ago, and Ryan was downright miraculous at times last year given that he was playing behind the league’s second-worst offensive line and throwing to Douglas as his top wideout for most of the season. If anything, people underestimate just how far Brady fell last year. Sure, he also didn’t have much to throw to thanks to injuries and off-field chaos, but he had a more effective running game and a far better offensive line than Ryan. He had his worst completion percentage since 2003 and his worst and fewest yards per attempt since 2006 — and after Rob Gronkowski suffered a torn ACL against the Browns, Brady simply couldn’t move the ball well at all. I’m not really sure why or how his receivers will be better this year; you’re hoping that Danny Amendola stays healthy or that Aaron Dobson takes a big leap forward. Don’t worry, though: They have all the mid-round backup quarterback prospects you could ever need to back up Brady! Manning is impossible to rank because he doesn’t fit in this vacuum. If you want to win a title in the next two seasons, you would give up just about anything for Peyton Manning. Even if he’s not the record-setter he was in 2013, he’s probably worth something like six wins on his own until the day he retires, which is impossible to get from anybody else in football. And he has virtually no long-term future beyond that, which is why he ends up somewhat unsatisfyingly between those two extremes. And Brees is here because he’s Drew Brees and you bring him up in discussions with Tom Brady and Peyton Manning, as per the accepted standards of football discussion. Maybe you didn’t see Quinn last year. Maybe you’re a season-ticket holder and a dedicated fan who doesn’t get to see other teams on Sundays. Or you’re a Sunday Ticket guy with absolutely no interest in watching an irrelevant team like the Rams for more than a play or two at a time. Fair enough. If you think Quinn is too high on this list, though, you’re wrong. Here’s the YouTube compilation of his 19 sacks from 2013, tracked, for some unearthly reason, to “Y.M.C.A.” And those sacks came despite the fact that teams only threw 521 passes against St. Louis last year, the sixth-smallest total in the league. Quinn sacked opposing quarterbacks once every 30.2 dropbacks last year, the 15th-best rate since 1983 (when sacks were first officially tracked). Maybe it’s a fluke year. Maybe Quinn gets a ton of support from having Chris Long and Michael Brockers up front next to him, a group that will add first-rounder Aaron Donald to the mix in 2014. Anything’s possible. But it’s awfully hard to find a player who was as good as Quinn this young who didn’t turn out to be a superstar for years to come. Maybe he ends up as a peak Osi Umenyiora, which would make him a perennial Pro Bowler. More likely, we’re looking at the next Ware. Quinn had more sacks last year than Griffen has in his entire career, and Griffen just got $20 million guaranteed. 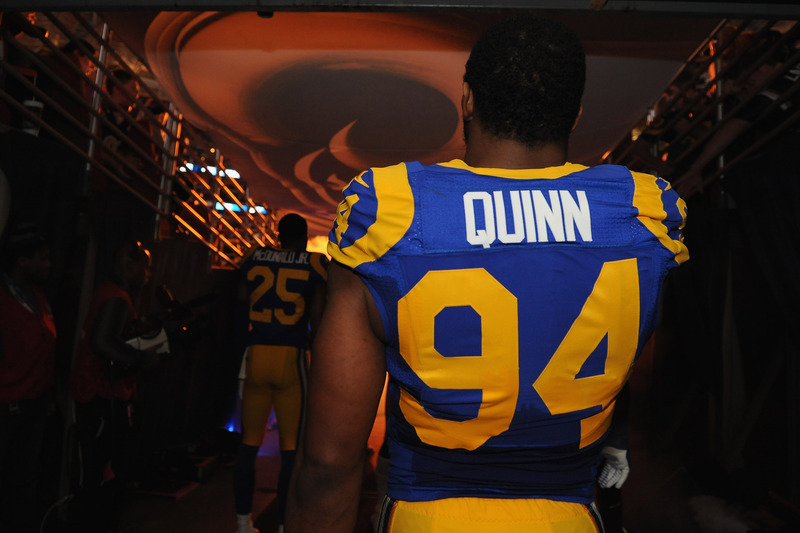 The Rams have Quinn for less than $10 million combined over the next two seasons. I really don’t know what Carson Palmer did to deserve this. • Ran for 181 yards against the Packers in a blowout win from which some Packers have never recovered (hit it, Raji). • Led his team from 17-0 down in the second quarter against Atlanta to win, 28-24. • Brought the 49ers back from 28-6 down and a 1 percent win expectancy in the third quarter to come within one ill-fated timeout of beating the Ravens. • Drove 65 yards in the final five minutes with a pair of third-and-long conversions to set up the game-winning field goal against the Packers. • Manufactured touchdown drives with big throws on either side of halftime to beat Carolina. • Marched his team down against the best pass defense in football in the most difficult place to play in football inside four minutes and brought them within one throw to the end zone of making a second Super Bowl trip in two seasons. I get that Kaepernick’s not perfect, and I’m sugarcoating a couple of those moments a tiny bit. (It was too soon for the iso throw against Sherman.) You know what, though? All of that stuff has to count for something. I’d be terrified to stand on the other sideline in a playoff game against Kaepernick. C. Kaepernick’s contract versus Newton’s contract to come. Right now, Newton is entering the final year of his four-year rookie contract, and the Panthers have already exercised his fifth-year option. Kaepernick, meanwhile, just signed a six-year, $126 million extension that will make him one of the highest-paid players in football. On those remarks, you’d almost definitely prefer Newton at the cheaper price. It’s more complicated than that, though. Because Newton was the first overall pick and plays the most expensive position in the game, that fifth-year option isn’t cheap. He has a cap hit of just more than $7 million this year, which rises to $14.7 million next year; it’s still a savings of a few million dollars versus Cam’s market value, but it’s no bargain. Kaepernick, meanwhile, doesn’t have the huge base salaries for his extension kick in until next season, so his cap hit for this year is a mere $3.8 million; he’ll actually cost San Francisco less over the next two seasons ($21 million) than Newton will cost Carolina ($21.7 million). And after those two seasons, the uncertainty of a new Newton deal makes Kaepernick’s contract look better. For all the chatter about how it guaranteed Kaep a whopping $61 million, it’s actually a very team-friendly deal that gives San Francisco the opportunity to escape after each season with little dead money. That gets interpreted around the league in two different ways. Ask some cap observers and they love the contract, because it leaves the 49ers with all the leverage while Kaepernick gets to bet on himself. Others wonder why Kaepernick would accept such a team-friendly deal and what it says about his future. Every person I spoke to suggested that Newton would not be willing to take such a deal and would want a more typical quarterback extension. That’s obviously his right, and I think Newton deserves it, but that would be a less-valuable deal in terms of trade value than the contract Kaepernick’s sporting. D. The Panthers have left Newton with a pile of crumbs. Newton’s supporting cast has hardly impressed during his time in Carolina, but it’s even worse this year. Steve Smith is gone. Brandon LaFell is gone. Jordan Gross, the team’s longtime left tackle, chose to retire. And the Panthers simply didn’t have the cap space to pursue viable replacements. The left-tackle spot is open to a variety of street free agents who weren’t especially impressive at right tackle last season. The Panthers drafted mammoth FSU product Kelvin Benjamin to play wideout in the first round, but he’s still raw; Carolina is likely to give more playing time to the combination of Jerricho Cotchery, Tiquan Underwood, and Jason Avant, a trio of competent third receivers masquerading as top wideouts. It’s not fair to Newton and hardly his fault, but he’s probably about to have his worst season as a pro. Yes, the numbers regressed toward the mean last year, because nobody picks up 20.5 sacks or bats down 16 passes each and every season. He was still J.J. Watt last year, even if the numbers weren’t all the way there. Nobody makes the players around him look like they shouldn’t be playing football more than Watt does. The 25-year-old wasn’t the Defensive Player of the Year last year, but he would still be your selection if you had to pick a favorite for this season and each of the next five seasons to come. And he’s going to cost the Texans $3.6 million and then $7 million on their cap over the next two years, chump change for the most terrifying player in football. Oh, and he gets Clowney to help out the pass rush this season. If there’s not a Costacos Brothers poster of those two available by the end of the season (“Texas Toast”? ), something’s gone horribly wrong. I still think, in a vacuum, that he’s the most talented quarterback in the league. He’s not no. 1 on this list because he’s 30 and makes a lot of money and the guys in front of him are younger and cheaper. Maybe the collarbone injury worries you for a guy who takes a few more hits than you might want him to while trying to make plays. I also see a quarterback, though, who lost both of his starting tackles before last season even began, in an offense where Jarrett Boykin, James Jones, and Andrew Quarless were starters most of the way. Who did this with the season on the line. He’s no. 1 in a world without the Gang of Four, and when they get big contracts, he might be tops in a world with them, too. We will have more Andrew Lucks, in that there will be more first overall quarterbacks who are incredible from day one and carry their team into contention almost single-handedly while providing millions of dollars of excess value in the process. I don’t know that the Colts would make it to 4-12 in an average division without Luck. What he did last season against the Chiefs was unreal; he made a 28-point third-quarter lead feel unsafe in a game in which he had already thrown two interceptions and then actually came back and won the game. He even added a third pick for funsies. The gap between Luck and everybody else below him on this list is larger than the gap between Rodgers and, say, Romo. You would make the Ricky Williams trade for Luck. You would probably make the Herschel Walker trade for Luck. You would cheat and lie and steal and relocate your team to London without the NFL’s permission if Luck wanted to move back there and play for you. A Russell Wilson — a mid-round pick who is good enough to suddenly turn around his team’s fortunes and win a Super Bowl while playing at a high level for peanuts — happens once a generation. Before him, there was Tom Brady. Before Brady, there was … Mark Rypien? Once in a generation might even be generous. If I picked Wilson to be ahead of Luck last year because of what his salary could do in allowing Seattle to pursue other weapons, and those weapons helped win the Super Bowl, and Wilson’s still two years away from being paid market value, how can I move Luck ahead of him in the Trade Value rankings now?